The industrial piercing is a body modification that you may have noticed more and more in the last year or so. If you were wondering what that large barbell in Kylie Jenner's ear on her instagram posts, that is an industrial barbell. An industrial piercing is a very unique design that gives its wearers and awesome, and sometimes edgy look, so be sure to check out our info below on all things Industrial piercing related. Industrial piercings are any two cartilage earrings connected by a single piece of jewellery. The industrial bar generally goes through the upper cartilage of the ear, usually the forward-helix and the helix on the opposite side, and looks like someone has put a little curtain rail across your ear..
You may have heard of the industrial piercings other names, the most popular being the ‘construction piercing’, or ‘scaffold piercing’. Sometimes it is simply known as ‘the bar’. An industrial bar can be placed in several different ways across the cartilage of the ear, horizontally, vertically or lopsided, you can choose your style. 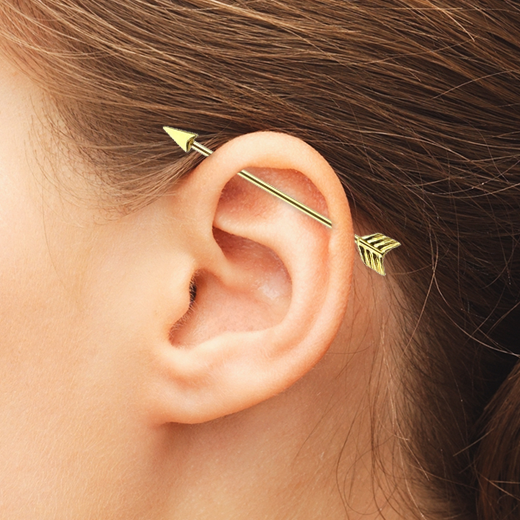 How much will an industrial piercing cost? This is just an average High Street price in the UK, of course there are other factors that may cause a variation in price. The quality of the store, popularity, location and qualification of the piercing artist will also play a role in how much the piercing will cost. Some piercers may also see an industrial bar as two piercings, which will cost double. Jewellery can come in all shapes and sizes, and may or may not be included in the cost of the piercing itself. Make sure that your first barbell is always made of solid titanium. How much will getting an Industrial Piercing hurt? It’s not going to be nothing, but the pain is minimal and completely bearable. There might be some discomfort, especially as you are getting two piercings, but it shouldn’t be too sore, more of a pinch really. It is no different to most cartilage procedures which are just a little bit different to lobe piercings. Of course, everyone handles pain very differently, and what you might find completely unbearable, someone else might not even notice. In general, it is about a 4/10 on the pain scale. It wouldn’t hurt as much as say, getting an IV drip in the hospital, and it will look awesome. 1. Research! Do a quick Google search of the piercing studios in your area, ask friends and family, or just ask around in general. Make up a list of the different places that look good to you. 2. Criteria Check! Make a checklist of different criteria the studio should meet, such as cleanliness, hygiene, safety, procedure, sterility, and of course, experience. 3. Shortlist! Call or email studios the questions you might have about their shops, and see which ones give you a good feeling and make you comfortable. 4. Visit! When you have narrowed it down to just a couple of studios, go visit them. Talk to the staff, see what equipment they use, ask questions and see if they make you feel comfortable with their expertise and procedures. 5. Choose a studio! If you’ve found the right place for you, then we recommend that you book an appointment with them, and look forward to getting your amazing new industrial bar. 1. Consult your GP about any allergies, medical conditions or medication that may affect your piercing. 2. Make sure to bring photo ID along, as your artist may not perform the procedure if he believes you are not old enough. 3. Avoid alcohol, caffeine and painkillers which may thin your blood or impair your decision making abilities. 4. Make sure you bring cash, as many studios might not accept card. Like all piercings, there are of course risks involved when getting an industrial piercing. 1. Run warm water over the piercing, or use a salt spray solution to loosen up and discharge and dirt around and in the piercing. 2. Twist the piercing around a little bit to make sure the solution and water go right through the piercing site and make sure to give equal care to each piercing. 3. Rinse and dry the piercing with a thick kitchen towel by dabbing the site. Know your Industrial Piercing sizes! The worldwide unit for measuring piercings is gauges, and generally cartilage piercings will be performed with a 14 gauge needle (1.6mm), but make sure to ask exactly what size you are getting, so you know what size jewellery to pick out. How long will an Industrial Piercing take to heal? Routine, hygiene and a little bit of luck will determine how fast your industrial piercing might heal. With proper aftercare and leaving the piercing alone (no touching), it can be fully healed in a month. Of course this is the best case scenario, and it can sometimes take up to 6 months. The results vary drastically from person to person. You should never remove or change your piercing until you are completely certain that it is fully healed. There are so many different options for industrial piercings. 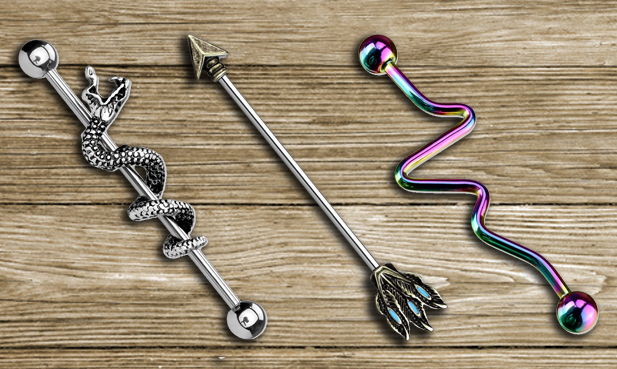 Industrial barbells come in all shapes and sizes, as you can get barbells, cute arrows, intertwined animals and so much more. Be sure to check out our wide selection of Industrial Barbells to find a suitable style for you. If you’d rather not have the industrial bar running across your ear during the healing period, you might prefer to get two seperate piercings with studs in each, that won’t get caught in anything while healing or feel as cumbersome. If you would also like to just have two smaller helix earrings, that is also a popular look at the moment.